Manufacturer of a wide range of products which include pad printing machine for printing industries. Keeping in the brain different necessities of our customers, we are putting forth premium quality Pad Printing Machine for Printing Industries. Our offered printing machine is manufactured utilizing most extreme quality segments and present day innovation in adherence with industry standards. We offer this printing machine to our clients in the wake of testing it on a few quality parameters. 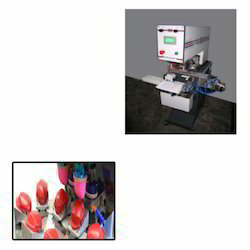 Looking for Pad Printing Machine for Printing Industries ?